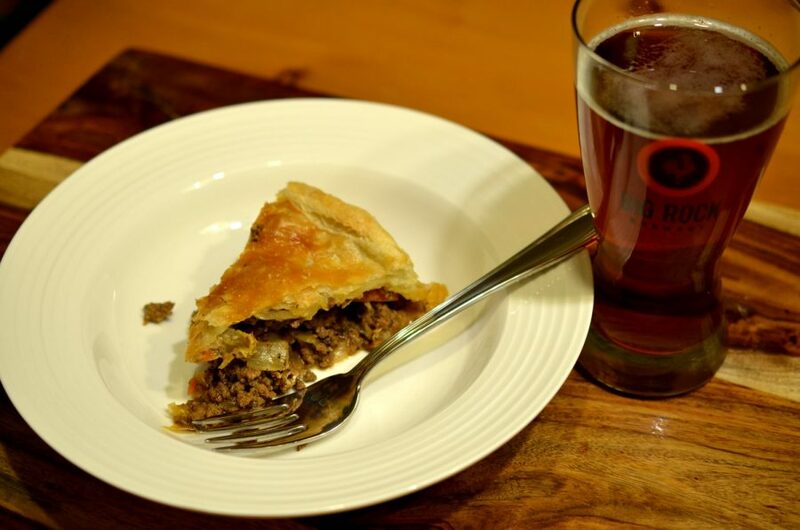 Meat pies and Scottish heavy ale go together like a Scotsman and a kilt. Only difference is you will want to know what is under our meat pies. Here is a recipe that is sure to delight and impress. Preheat the oven to 400F. Grease and flour a spring form pan. In a medium saucepan, boil the potatoes until they are tender. Meanwhile, in a large skillet over medium heat, saute the ground beef until fully cooked. Drain all liquid from the ground beef and remove from the pan. In the same pan add the vegetables and spices and saute until the onions are translucent (add additional oil to the pan if the pan is looking dry). Add the beer, tomato paste and ground beef and simmer until all of the liquid is absorbed. Add the potatoes once all the mixture has reduced and there is no liquid left. As the potatoes and boiling and the pie mixture is simmering, roll out both pieces of the puff pastry . Use one rolled piece of puff pastry to line the spring form pan. Fill the pan with meat mixture. Cover the pie mixture with the second piece of puff pastry, cutting the pastry piece to the shape of the pan (a circle). Fold the edges of the pastry lining the bottom of the pan in on top of the pie mixture and brush with the egg wash. Place the circular top puff pastry piece over the pie mixture, sticking the circular piece to the egg washed bottom sections. Brush the entire top of the pie with egg wash.
Bake for 20-30 mins or until the pastry is golden brown. Remove from the oven and let cool for 10 mins before cutting.